So, here we are again, the annual rite of spring, opening day of Major League Baseball. Okay, so the Dodgers and Diamondbacks got a jump on everyone by going down under in a convoluted scheme by the commissioner to expand the brand of MLB by playing a three day set in Australia. So, the Dodgers are up by 3 and Arizona is mired deep in the cellar of the NL West and everyone else is still busy unpacking and repacking as they prepare for the 2014 season. However, since this is a Braves site, I won’t waste a lot of time worrying about the other 29 teams in MLB, I am going to focus primarily on this blog’s namesake. So, without further ado, let’s discuss the pluses and minuses of the Braves’ 2014 addition. First the pluses. Location, location, location…. or in baseball speak, the schedule. As opposed to last season when the Braves has one of the toughest schedules to begin the year, this season, Atlanta faces one of the easiest schedules. I’m not saying the Braves will win three out of every four games but at least they should not be mired 10 games behind the Nationals by April 10th. Is that even possible? The Bravos who are clearly wounded by the double whammy of Kris Medlin and Brandon Beachy going down on successive days to elbow injuries, the Braves went from pitching rich to pitching poor almost over night. At least the braves were fortunate to have Ervin Santana still available for a late spring acquisition. While Santana might never be confused as a Greg Maddux level signing, he certainly may prove to be the guy who saves Christmas for the Bravos this season. Mike Minor and his “Damn Brother, I don’t Think I would Have Told That” condition/injury which I am sure must have been both painful and embarrassing for him. I think I would have just said I got dropped kicked in the family jewels in a bar fight and been done with it. Anyway, at least it is not an elbow….. He should be back by May and along with off season trade pick-up Gavin Floyd, who is also returning from Tommy John surgery should give the 2014 Braves a much different look as far as their pitching staff goes. After all, a starting staff of Ervin Santana, Mike Minor, Gavin Floyd, Julio Teheran and Alec Wood/Arron Harrang seems infinitely more intimidating, at least on paper, than one of Julio Teheran, Alex Wood, Arron Harrang and David Hale. Of course, you just never know. Every team is on small tendon away from being on tap to being an also ran. The Braves still have a potentially strong bullpen staff. One which is the main difference between them and 20 or so other major league teams. Not saying there are not so weak links but getting back a strong Jonny Venters for the second half could be a real difference maker. And think, we have not even begun to talk about the Braves’ offense. That could be the real difference this season for the Bravos. A rejuvenated Dan Uggla appears to be set to finally be the guy Frank Wren traded away play maker Omar Infante for. $13 million dollars a season is not that big a contract these days as far as professional baseball players go but for the Braves, it is a significant chunk of coin. Along with BJ Upton who without question was the biggest disappointment for Atlantan’s since Sherman broke thru the defenses of John B Hood in 1864, Uggla and BJ both appear ready to finally pay off on Wren’s investments. Ryan Doumit also looks to be a good off season pick-up for Atlanta. A guy who has power and can play several different positions as well as catch give the Braves some protection against Evan Gattis not being able to live up to last year’s storybook season. I’ll be honest, I think Evan will get off to a bit of a slow start because he has not had the opportunity to get his timing down this spring. Remember, last year Evan won a spot due to his red hot bat which had the benefit of some winter ball to get him going. This year, we learned El Orso Blanco had off season surgery on his left knee. Who knew it was a problem? No one ever mentioned it last season. Still, the Braves will miss BMac but all and all, I think the Braves will be okay at the back stop position. Freddie Freeman has been red hot all spring, he looks to be finally become the Super Star a lot of us all thought he would be. Personally, I have thought Fab 5 has been overlooked by a lot of folks as far as his value to the team. A lot of balls are snagged by Freddie that go as throwing errors for the rest of the infield whenever someone else occupies the 3 spot. Jason Heyward has looked strong this spring and is poised to be the biggest and strongest lead off man in the majors. Put that in with a gold glove defense and I think we will finally see J-Hay begin a string of All-Star appearances. The other brother from a different mother (and father) Justin Upton hopefully will play with a little more fire. He can be really, really good at times but he sure can give appearances of being lackadaisical at times. Simba keeping up his excellent glove work as well as the improved play of Chris Johnson at third can really benefit the Atlanta pitching staff. While I think it will be really difficult for CJ to repeat his 2013 season as far as his batting average is concerned, Andrelton’s continued maturity at the plate should make up for it. Simmons has surprising power but it is his low OBP which is worrisome. The Braves have a strong bench with Doumit, Pena, Laird, Schafer and Pasternicky. The one thing the Braves lack is an extra power bat from the left side. Did we ever think that would be the case? After being lefty heavy for so many years? So, let the games begin! Try not to get too high or too low because as we have seen for so many seasons, things can change in the blink of an eye. Riding high in April, shot down in May…. So true, especially in baseball. 162 games of nail biting and then there are the play offs but first you have to throw out the first pitch. What an odd winter we as fans of the Braves have experienced. It began with the announcement the Braves would be moving into their own house beginning in 2017 to a location 17 miles north of the Ghetto. Away from the site of occupancy they have plied their trade for nearly fifty years now. I guess when we think about a club making a “big move”, that is not exactly what most fans would let come to mind. Not that I blame the Braves organization for wanting to look at how they can stay relevant. They are saddled with what is considered one of the worse local TV deals in all of professional sports. That’s right, not just baseball but in all pro sports. Well, if you are handed lemons, it is good to know how to make lemonade and a little lemon zest to get maximum return on your lemons. Maybe even plant a few seeds to grow your own lemon trees, too. Looks like the Braves may have done just that. No big free agent signing occurred this season by the Braves. It was really more of a subtraction than an addition in that respect. Former Braves “Baby Brave” Brian McCann signing long term with Yankees for $85MM and mildly surprising bull dog and former staff ace Tim Hudson bolting to the west coast for a 2 year $23MM deal. I would suspect that is about double what the Braves were willing to risk for a guy who is in decline. I can’t really fault either party for that one. The Braves just did not value Tim that much and BMac’s departure has been long seen by many as a one-trick pony whose future is in a place where he needs to hit only four times a game to be successful. Big Poppi in Boston has certainly been able to make a living doing just that. In a real baseball league, everyone has to hit and play the field on a fairly regular basis. So, how do you stay relevant where your competition are getting 2 billion dollar local TV deals? Looks like the Braves have made a good start. They have taken a page out of the government’s play book and put in a bunch of back loaded contracts. Not that I don’t applaud Frank Wren and company for thinking outside the box a bit by locking up the core of their home grown talent that has some pretty significant balloon payments at the end. (Didn’t they outlaw those in the mortgage industry?) Anyway, if it looks good and gives the Braves some stability in keeping their core players together, all the better. It looks like a lot of money but the way the contracts are structured, it will be the problem of the next owner and General Manager when 2018 rolls around. The Braves will likely have to pay Heyward if he finally develops into another Freddie Freeman as far as a reliable, everyday player or super star. Other than Robinson Cano, I did not really see player contract escalating this past off season. Heck, in five years, who knows what the dollar will be worth? So! Where does that leave us? The Braves had a surprisingly good team last year. They really were a .500 hundred team for the most part but they took full advantage of a couple of 14 game winning streaks and the too late surge by a disappointing Nationals team who for all intents and purposes took their pre season press clippings a little too seriously. What was their greatest weakness? Their bullpen, and all of us have seen that movie before. – An Evan Gattis who can continue to inspire blue collar guys everywhere by swinging a big bat and tape measure home runs. That and he continues to hold up behind the plate. – A Fab 5 who continues to be clutch at the plate and keeps saying infield errors with the incredible ability to snare baseballs off the deck and way off the mark at first. – A super star shortstop who is beginning to look like the next Ozzie Smith, who shows a bit more maturity at the plate and improves his on base percentage with more walks and line drives and fewer pop ups. – The Braves have to hope that the guy who was considered a “throw-in” for fan favorite Marteen Prado continues to amaze with a a hot bat and an improved glove at third. For the Braves to stay on top, in addition to the above, two of the most disappointing players in Braves history have to at least be among the league average when it comes to hitting. They say strike outs are no worse than any other out. But, with automatic strike outs every at bat, far too often we see the bases loaded with no outs – yet no one scores. A young pitching staff full of number twos and threes are going to have to step up and stay focused on keeping their team in the game and hope the good guys can hit a three run homer or two and not feel the need to be perfect every game. It is that feeling of continuous pressure which leads to ulcers and gray hair. The Braves secret weapon still has to be their shut-down bull pen. That is the real reason the Braves finished where they did last season. No team outside the Yankees can bludgeon the opposition into the submission every game – and even they found out what it means to have a weak pitching staff. The Braves may have lost O’Flararty to the A’s this season but they have been without him for quite a while. They still have the best closer in baseball and don’t ever think that the last 3 outs in a baseball game isn’t the hardest to get. The only people who don’t think so are the teams who don’t have that “go-to” kind of guy . Just like having an Ace at the top of the pitching staff who gives your team confidence they can put up a W whenever he takes the mound, having a shut down guy at the end of the game helps everyone on the team try to turn it into a 6 inning game. SO LET’S GO BRAVES… LET”S REPEAT!!! Good morning folks….. Well, the time has finally come for the Braves to make the push to go into the play-offs with a big head of momentum. I think the last thing we Braves fans want to see is the Los Bravos backing into October. I guess this means for me, no more Kameron Loe, no more “B” squad line ups, no more en mass days of rest. Funny how even with a 14 game lead, how tenuous I feel about the Atlanta team’s chances going into October. The Braves have a stable of pitchers who are capable of throwing a no hitter on any given night, unfortunately, they are also capable of being bombed out of existence on any given night. Besieged by walks, coupled with tape measure home-runs. So, what to do? First off, put Philly out of their misery quickly. Then dispatch the Marlins and finally drive a stake thru the heart of the Nationals’ hope for a final wild card spot by taking all three from the gNats. Right now, the Braves have a big ol’ bulls eye on their backs as far as the rest of the NL East is concerned. Kids trying to win a spot on next year’s roster on their respective teams. Veterans trying to show they are still relevant and teams in general saying we can beat you even if you win the title. Working against the Braves right now are certain players who don’t feel the need to continue to play all out. We have seen many times in the past that employing the button downed, aloof approach as far as the playoffs has backfired on the Braves. The one real edge this year’s edition of the Atlanta Braves is they are all relatively young, but still have been hardened by the memories of past failures. absence of Tim Hudson, Brandon Beachy, Jonny Venters, Christian Martinez, Eric O’Flarety and at times Jorden Walden and others, the Braves have continued to lead the league in wins, ERA, saves and other assorted stats. Despite the absence at various times their front line catcher, Brian McCann, time spent on the DL by Jordan Schafer, Freedie Freeman, Reed Johnson and now Jason Heyward, the Braves have continued to win. Finally, despite the lack of production by the Braves’ two highest paid players in BJ Upton and Dan Uggla have still won to the point they lead all of Major League Baseball with the best record. So Braves fans, as we continue to ride the wave of success the Braves have had this season, it is with great trepidation we await the final games of September and hoped for momentum to go all the way to the World Series. * We can start with the certainties. Catcher, 1B, 2B, 3B, CF and RF. They can talk all they want about RF being an open competition. There’s a Greek word for that… baloney. That will be JHey’s for as long as he wears a tomahawk. * What to do in left field? Well, JTerd (Joey Terdoslavich), currently a 1B, is tearing up the AFL. He hits for both power and average, and is being strongly considered for a position change to LF. 1B seems to be occupied for a while. But he will start 2012 in AA, and isn’t even on the radar for competing for a spot on the 25. We need to acquire a veteran guy who is a proven hitter. Frank’s track record says it won’t be through FA. A trade is a’comin’. What about Martin? Martin Prado is one of the best utility guys in either league. He is just a mediocre everyday outfielder. He would benefit the Braves better back in the super-utility role. * Which brings me to SS. I’ll bet that Gonzo returns on a 1 year deal. He’d probably like a 2 year deal, but I honestly don’t think he’ll get that anywhere, and not from ATL either. Love his glove. His bat could do more, but he wins you games with his D. Pitchers love him. and Arodys Vizcaino proved he is a capable MLB pitcher. I won’t be surprised to see Arodys slide into EOF’s 7th inning role, allowing EOF to move around and make the pen a bit more versatile. Jonny and Special K return to their shut down roles. Martinez was very good at times in his long relief role, and I see no reason to believe he won’t return to the same. So 1 spot remains… DLowe? God, I hope not. I think Anthony Varvaro earned it, though many think that Cory Gearrin would fit Peter’s old “ground ball specialist” role. I can see that. That will likely be a spring training battle. * DLowe has to go… even if only for the clichéd “bag o’ balls”. The truth is, he still has value, if not $15MM worth. But he is a veteran hurler who can adjust and can still pitch effectively at times. Remember the near no-hitter earlier this season? Yes, that was this season. That said, he has worn out his welcome in Atlanta, and would likely benefit from the proverbial change of scenery. The only real question is how much $$$ are the Braves willing to eat in order to move him? I’ve already beat this mule and won’t rehash it here. concerns surrounding both JJ and Tommy. That’s too bad. We needed one of those guys as a trade chip this offseason. Can’t do it now, you’d just get pennies back on the dollar. 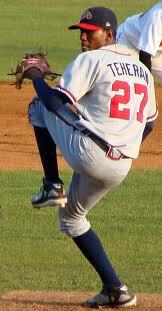 But Julio Teheran has nothing left to prove at AAA, and Delgado established himself in his big league starts as well. Too many starters… it’s a good problem to have. But if you’re Frank, it’ll give you even more grey hair. There will be more scrutiny over what he does here than anywhere else on the roster. That’s a tough call. If it were me, I’d take it to spring, prove one of either JJ or Tommy are healthy, and find a team desperate for a starter. That’s where you’ll find your LF. Gil in Mechanicsville, VA – Some surprises were had as the Braves prepared to break camp and head north to begin the season for real. The announcements to opt for performance rather than potential and also choosing a guy in Brandon Beachy who has shown both poise and skill over a guy on whom ten days ago I would have bet heavily, Mike Minor, because the Braves have a much larger investment. As a number 7 pick in the first round draft in 2010 plus a rather healthy signing bonus with the added benefit of potentially being the only left-handed starter on an otherwise right-handed staff, The Beach just flat out-pitched his competition and won the final spot in the rotation. I was fortunate to see Brandon pitch early in the spring against the Nationals and he had it going then. He does not possess an overwhelming fastball but, folks, his change up is truly outstanding and his control is said to be Greg Maddux-like. That is pretty great company to be mentioned with when you are comparing control. From my vantage point, I was unable to see exactly where the ball was pitched but I did see some really funny swings being taken by the likes of Jason Werth and LaRoache. It is not as if Beachy is a “strike out” pitcher but I did not see one hard hit ball by the Nationals in his stint on the mound. With his selection by the Braves as the number five guy in the rotation, I suspect that trend continued in his other games this spring as well. Other surprised this spring may have been the selection of the diminutive Matt Young as the Braves fourth outfielder and Brandon Hicks as the utility infielder. Young has proved he can hit for average and, with his speed, he will turn a lot of long singles into doubles. He also appears to be able to hit in the clutch. You don’t always need a three run homer to win ballgames. How many times last year did we see the Braves fail to score after loading the bases with no or only one out? The kid, and I use that term loosly as he is 28, can also play all three outfield positions and was also used at second base this spring. He looks to be a gamer. Every team needs a guy like this on their team if for no other reason than to ambush a pitcher who is looking into the dugout to see where the boppers are. I guess the real surprise has been that Young managed to play his way onto the team over Joe Mather who had been touted as the next “Great White Hope” by the Atlanta press. Though Mather was given plenty of opportunity, he just appeared to play poorly while Young simply played better in every opportunity. Brandon Hicks may have finally reached his potential. A number three pick by the Braves behind Francouer and McCann, he has always possessed a great glove but his poor hitting has forced the Braves to keep him in AAA. Bobby Cox has said he was one of the best young shortstops he had seen but it has always been his bat that held him back. Perhaps the positive in the Braves opting for Hicks as their primary back-up over Diory Hernandez is Hicks’ ability to play third and Brandon appears to have added bulk this off season so a bit more power to be had with the stick. Diory was also a bit disappointing with the bat this spring but I suspect he will be in Atlanta at some juncture during the season. I don’t mean to paint that devil on the wall but six months is a long time in baseball and obliques get tweaked and elbows, shoulders and hammys somehow manage to be a problem for everyone at some point. 100: Is It Spring Yet? Mechanicsville, VA – Now that the baseball gods have been sated for another year with a vast array of broken bats, juiced baseballs, torn laburnums and torqued obliques, we can lament yet another year that the Braves failed to win a World Series. The fact this year’s team may have been the epitome of over achievement, not withstanding. Of course congratulations are in order for this year’s winner of baseball’s fall classic, the San Francisco Giants. Who would have thought that the toughest challenge they would face in the post season would have come from our very own Braves? So the Giants go on to become the champions of the baseball world and alas, by the grace of God and a defense leakier than a shanty town roof, there goes Atlanta. Then again, a few timely hits would have helped too. But that is the past. Now it’s back to the future, that ever renewing event we call a new season, a fresh start, a new beginning. No time to stop and let the Giants enjoy their first World Championship in over 50 years. No, we press on, anxiously awaiting the start of what will surely be the Fredi Gonzales era. No need to fret that Liberty Media will tightly control the purse strings. Hasn’t Fredi done more with less? Can he find success in his adopted home town or will the first five game losing streak be met with shouts from the blogisphere for his immediate dismissal and angst about how he is a Bobby Cox clone? 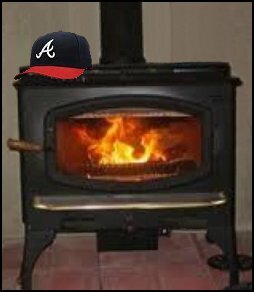 I say let’s get the old hot stove glowing! Time for all the fantasy team owners, deep in the bowels of their moms’ basements, to spend countless hours trying to get the jump on their brethren by scouring reams of stats, pounding away at the importance of WHIP, run differential, RBI with two outs and runners in scoring position and of course LSMFT. And we can all hope Santa will leave a Big Bopper to play left field under Frank Wren’s Christmas tree while we are at it.